Lavera Basis Sensitiv Moisturizing Cream is for the whole family with all skin types, it comes with organic Jojoba oil & organic Aloe Vera. Treat yourself to supple, protected skin. Jojoba oil and Aloe Vera gel deeply moisturize while organic essences help the skin stay healthy. Precious vitamin E and Shea Butter combine to help reduce the appearance of aging. 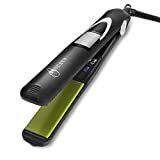 VIBRAstrait Oscillating Flat Iron, 1"